In tandem with The Love Edition: Falling Hard, Reconstructed: The Art of Rea Lynn de Guzman, is exhibited at the Bindlestiff Studio Gallery Space. Root Division will host a performance event during the closing reception on Saturday, February 9th from 7-10 pm. This one night only evening of performance complements the visual art exhibition, Wander Woman. Performance offers a unique communication tool and physical manifestation of the immigrant womxn body experience. In tandem with the exhibiting artwork, this evening of performance intends to transcend geographic boundaries by offering a variety of perspectives through diverse movement of how the body remains strong, resilient and individual despite outside forces and stigmas trying to strip the body down or push it to the margins. 7:00-9:30pm: France Viana - "Ube Trade"
7:30-9:30pm: Christabel Soto - "Narcissus"
7:30pm: Takako Matoba & Minoosh Zomorodinia - "Two Rivers"
7:45pm: Reading by Trinidad Escobar - "Crushed"
8:00pm: Behnaz Khaleghi & Baharak Khaleghi - "Eternal Laughter"
8:15pm: Pallavi Sharma & Shailaja Dixit - "Sorry Not Sorry"
8:30pm: Greta Liz Anderson - "No Ma Dic"
9:00pm: Sam Cortez - "Fallen Dreams"
Correspondingly, many immigrant women artists of color evoke Wonder Woman-esque qualities in their contemporary artistic practices by addressing issues of immigration, misrepresentation, stereotypes, cultural conflict and feelings of acceptance or intolerance with an honest voice to fight for equality. Whether autobiographical or not, Wander Woman exhibiting artists' works present complex characters and narratives highlighting transcendent experiences, often derived from their own personal perspectives. 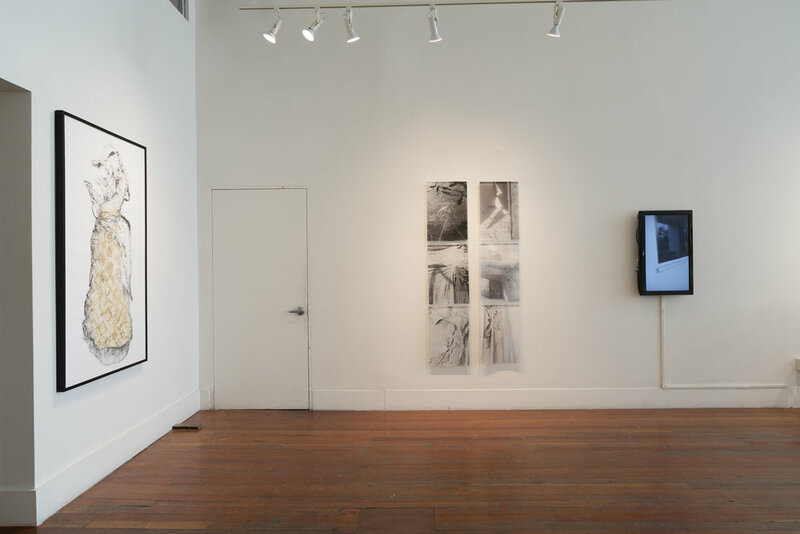 Wander Woman features works by Bay Area, first-generation immigrant women of color, who vary in professional backgrounds from emerging to established and have immigrated to the US from different parts of the world. 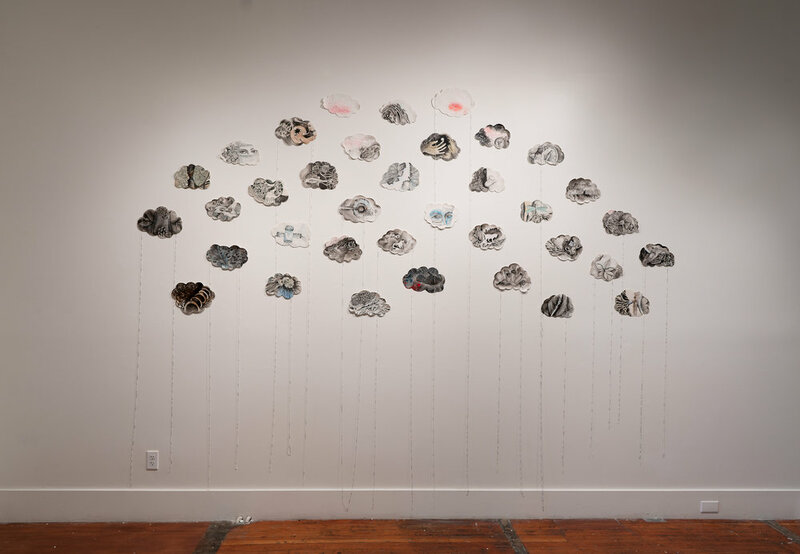 Inspired by shared-yet-dissimilar psychological experiences of immigration and assimilation to the Bay Area, exhibiting artists present nuanced, intricate perspectives, and narratives that have developed beyond the initial concept of identity in their art practice. Rea Lynn de Guzman, Woven, 2010. Oil on canvas over panel, 32" x 48"
Gallery Hours: Tuesday–Friday, 12–7 pm and Saturday, 12–5 pm. 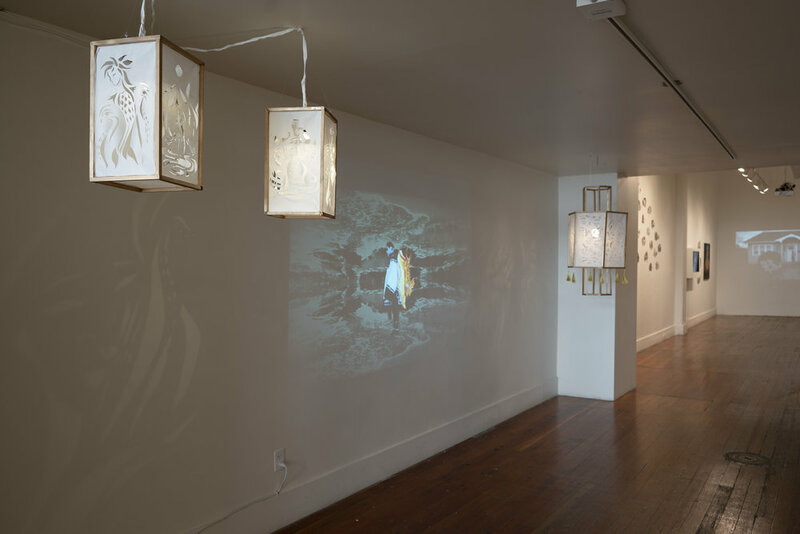 Co-presented by Kearny Street Workshop and the Asian Pacific Islander Cultural Center, and curated by Kathy Zarur and Roula Seikaly, Betweenscapes interrogates the spaces between colonial power and indigenous resistance, diaspora and homeland, us and them, here and there. Betweenscapes presents the work of 14 artists that visualize the in-between as a site of criticality, addressing unresolved histories and posing questions about colonialism, migration, and transnational solidarity. Check out SF Weekly's review of our show here. The Sister City Prints project has taken a novel approach to art making and turned it into a show brimming with inspiring stories and exciting artworks, all with a printmaking flavour. In the spirit of true global cooperation, Adelaide artist and curator Andrea Przygonski has brought together 11 contemporary Australian printmakers with 11 international artists and asked them to create something together. Artists from Adelaide, Melbourne, Brisbane and Perth were teamed with artists from Canada, Estonia, France, Ireland, New Zealand, and the U.S. The catch: most had never met each other before. Surpassing the boundaries of distance, age and vastly different degrees of commercial success these artists connected with each other to build relationships and create work that expresses their individual interests and concerns. "APAture is Kearny Street Workshop’s annual multidisciplinary arts festival that presents and promotes art by local up-and-coming artists of Asian and/or Pacific Islander descent. For fourteen seasons, the festival has sparked dialogue around contemporary social issues, especially those that affect Asian and/or Pacific Islander communities, and inspired collaboration between artists and community members toward social action. This year, our theme is “Unravel.” Examining our stories, hxstories, narratives, beliefs-- what are the interconnected threads we wish to investigate and untangle? What is there to discover when we unravel?" Please join us for (De)Centered: An Exhibition of Filipino American Artists, co-curated by Isabel Manalo and Janna Añonuevo Langholz. The exhibition will also be the official book launch for the Fil/Am Artist Directory’s first publication. (De)Centered includes artwork by 22 Filipino/a-American artists, who hail from across the United States. In their respective artworks, the artists show a connection to both the Philippines and the U.S. and their attempt to remain centered in both places. 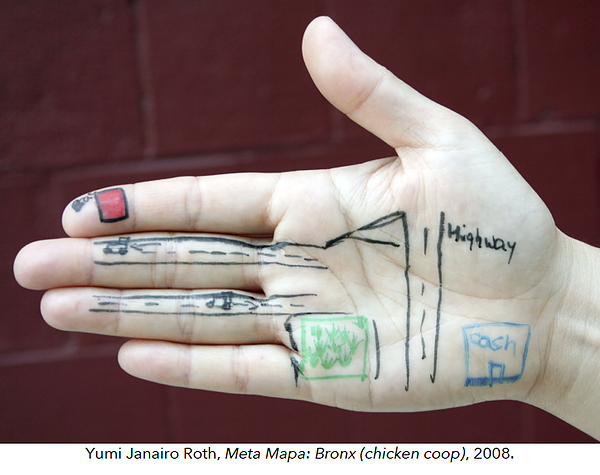 The work ranges from painting, drawing, and photography to installation and video. "Exhibition to launch first directory of Fil-Am artists," INQUIRER, April 19, 2017. "Root Division proudly presents New Growth 2017: EmPOWERing Peace, Justice & Love, our annual Youth Art Celebration & Exhibition, featuring hands-on family art-making activities alongside an exhibition of artwork made by students and instructors in Root Division’s free after school Youth Education Program (Bessie Carmichael Elementary, Buena Vista Child Care, Cesar Chavez Elementary, Community Housing Partnership, Filipino Education Center, Horace Mann Middle School, Larkin Street Youth Services, Mission Education Center, SF International High School and Southern Exposure and Root Division's 1:1 Teen Mentorship). Root Division’s Youth Education Program recruits, trains, and places our Studio Artists, volunteers and interns to teach free art classes in one of our nine partner sites, creating a link between practicing artists and the schools’ communities. All of Root Division’s programs serve a diverse group of students, most of which attend San Francisco Unified School District schools." "An Expanded Approach to Asian-Americannes at Vessel Gallery," KQED Arts, April 13, 2017. Rea Lynn de Guzman is an interdisciplinary artist whose work explores psychological and socio-political themes surrounding liminal identity, cultural assimilation, and the Filipino/a diaspora, tempered by her experience as a Filipina immigrant living in the United States. At the age of fourteen, she emigrated from the Philippines to the United States with her single mother, settling eventually in San Francisco. She lived in the Tenderloin—on Turk Street between Taylor and Jones—during most of her formative years (circa 2000-2005). 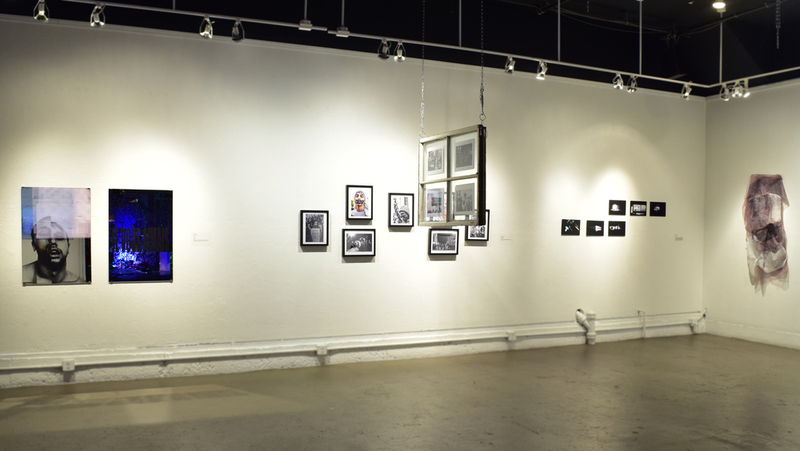 TL Dreams parallels the idea of the “American dream,” inspired by memories shared with the artist's fellow Filipino/a immigrant friends who lived in the Tenderloin neighborhood. It explores the difficult, yet exciting and hopeful journey of finding oneself entangled in a web of changes, cultural confusions, and obstacles while coming of age. This exhibition features two bodies of work representing nuanced perspectives on distinct periods in the artist's life. In her early work, de Guzman presents hyper-colored and playful scenes of an imagined world in a state of flux from a young woman’s perspective. Now, sixteen years later, the artist reflects on these shadowy memories in muted monochromatic works indicative of her challenging and often painful experience. Located on the campus of San Joaquin Delta College, Delta Center for the Arts LH Horton Jr Gallery presents Social Constructs, an Exhibition on Identity and Perception. Admission to the Gallery is free and open to the public. 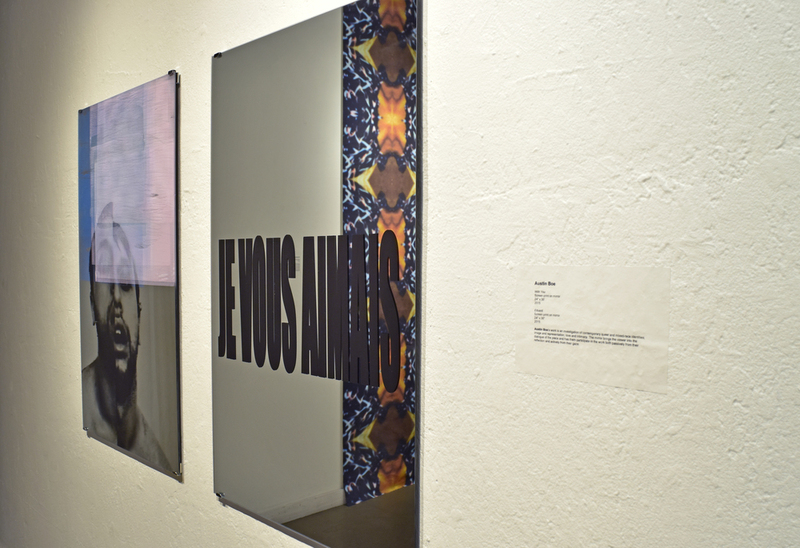 The Social Constructs art exhibition questions common social and cultural identity assumptions. Themes include race, gender, nationality, socioeconomic status, and a shifting reality of what it means to live “The American Dream.” Artists’ works explore topics from their personal cultural heritage, and how socially constructed “realities” have shaped and often misinformed our perspective of the represented cultural groups. Other topics address global concerns such as the lack of affordable housing, health care, climate change, gun violence, and immigration. Rea Lynn de Guzman explores psychological and socio-political themes surrounding liminal identity, cultural assimilation, and the Filipino/a diaspora, tempered by her experience as a Filipina immigrant living in the United States. The Retaso Series references the iconography of “Maria Clara” (a mestiza character from Jose Rizal’s novel Noli me Tangere and metonym for a traditional dress woven from piña fiber and organza). Influenced by Spanish colonization, “Maria Clara” embodies Philippine ideals of female beauty equated with light skin, accompanied by stereotypes of chastity and demureness. Her work presents and challenges the displacement and inferiorization of native ideals by the colonizer, signified by clothing made from a foreign fruit. Through the process of repetitive layering and a palette evoking skin tones, de Guzman utilizes the tactility of specific materials such as image transfers on synthetic organza to extract and repudiate these imposed ideals and stereotypes—material remnants intertwined with cultural legacies. 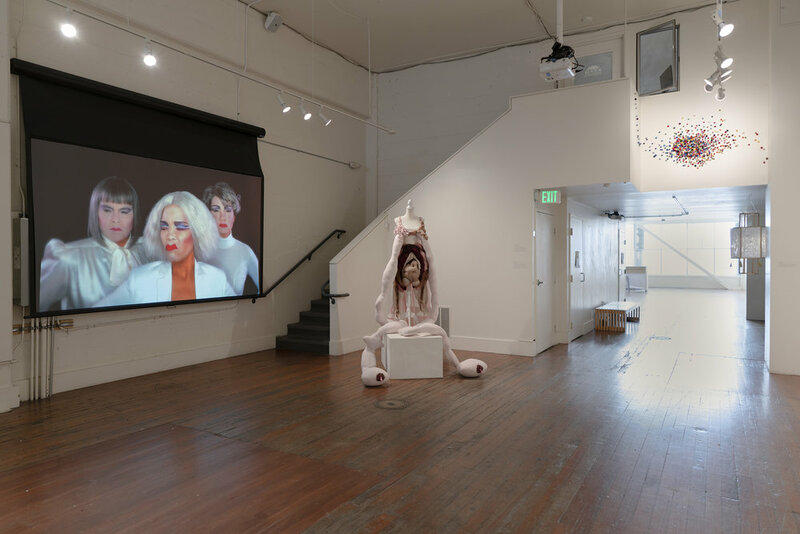 Presented as part of a two-month exploration into consumerism and cultural expression in the Bay Area, Root Division’s front gallery will feature a two-person show by Irene Carvajal & Rea Lynn de Guzman. 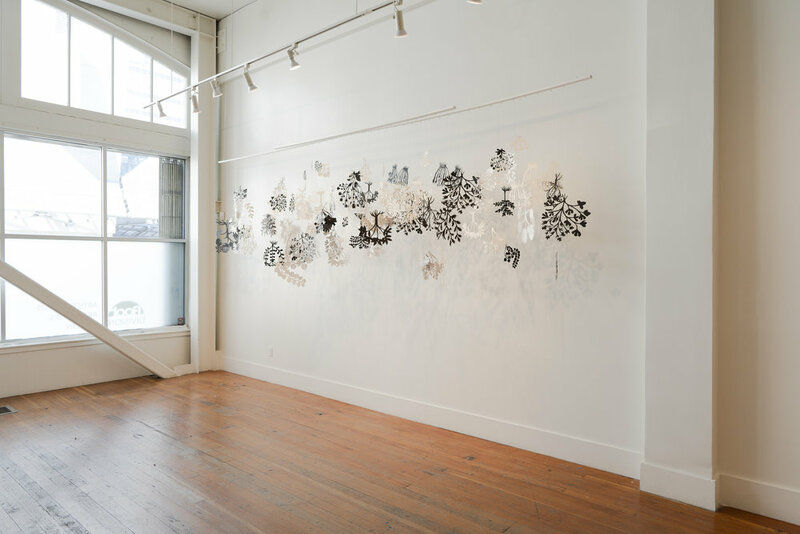 Through parallel experiences originating on opposite sides of the world, these Bay Area artists confront universal themes of diaspora and concepts of femininity stemming from their Costa Rican and Filipina heritage. Cut From The Same Cloth combines installation, print, and sculptural media with an emphasis on fiber and textiles. Utilizing textiles as a metaphor for a colonized society, Carvajal and de Guzman explore themes of diaspora, hegemony, gender roles, labor, value, and their effects on our psyche. In this solo show, San Francisco-based artist Rea Lynn de Guzman references the iconography of “Maria Clara” (a mestiza character from Jose Rizal’s novel Noli me Tangere and metonym for a traditional dress woven from piña fiber and organza). Influenced by Spanish colonization, “Maria Clara” embodies Philippine ideals of female beauty equated with light skin, accompanied by stereotypes of chastity and demureness. 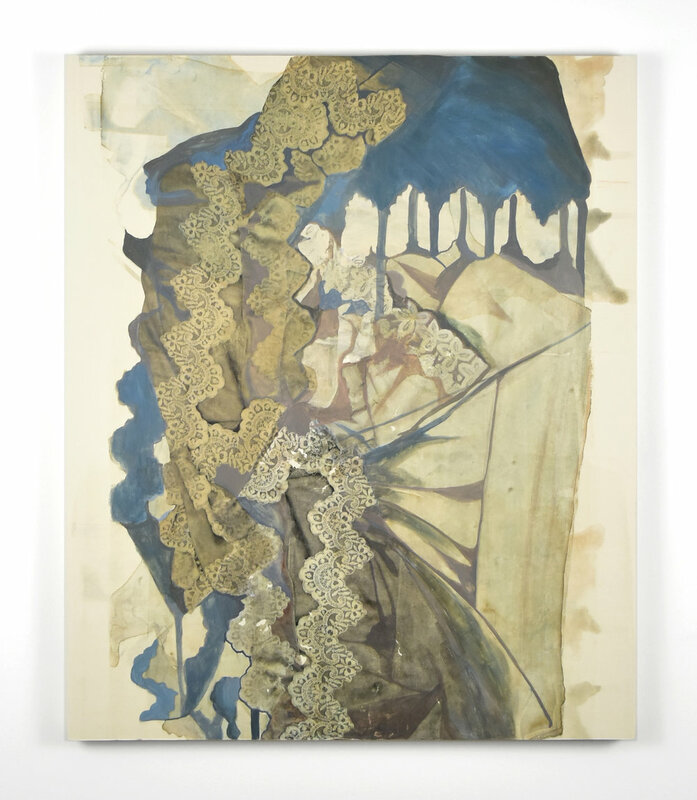 Through the process of repetitive layering and a palette evoking skin tones, de Guzman utilizes the tactility of specific materials such as image transfers on synthetic organza to extract and repudiate these imposed ideals and stereotypes—material remnants intertwined with cultural legacies. 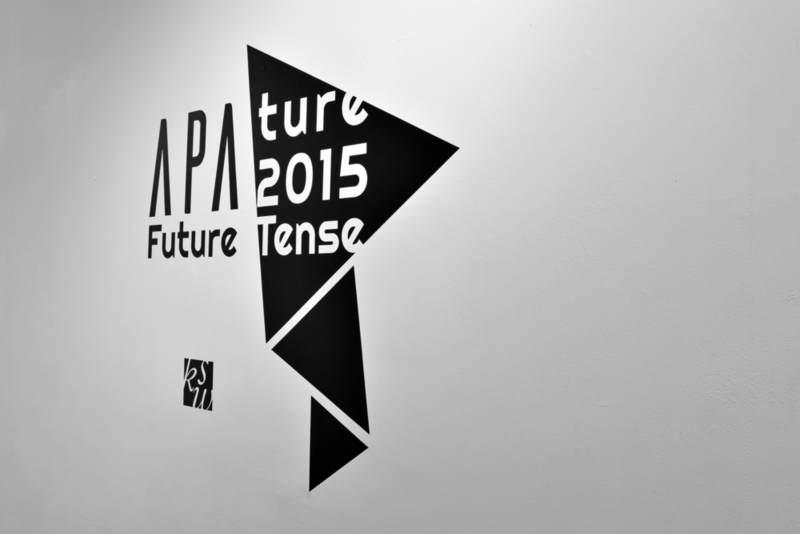 The Asian Pacific Islander Cultural Center (APICC) presents Resistance, a visual arts exhibition as part of the 19th annual United States of Asian America Festival. Curated by Pamela Ybañez, this group exhibition features multidisciplinary works of 10 Asian and Pacific Islander artists from the San Francisco Bay Area and beyond exploring themes of gentrification, displacement, placemaking, and the artist’s role in the community through installation, performance, video, and more. Creating a space of expression, exploration, and reflection, the exhibition strives to engage community members to feel empowered and arts communities in San Francisco, Oakland, and elsewhere to intersect in order to present possible solutions around the complex issues of displacement that artists and a multitude of others currently face. 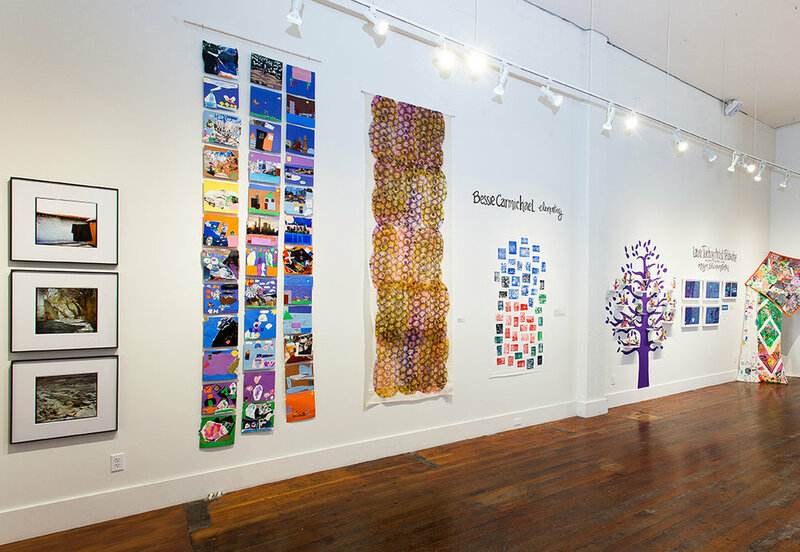 Root Division proudly presents New Growth 2016: Celebrating our Community, our annual Youth Art Celebration & Exhibition, featuring hands-on family art-making activities alongside an exhibition of artwork made by students and instructors in Root Division’s free after school Youth Education Program. Root Division’s Youth Education Program provides free art classes to seven after school programs in San Francisco (Bessie Carmichael Elementary, Buena Vista Child Care, Cesar Chavez Elementary, Community Housing Partnership, Horace Mann Middle School, Larkin Street Youth Services, Mission Education Center). In addition to training and placing our Studio Artists at partner sites, we recruit volunteers from the local community to help teach classes in drawing, painting, mixed media, photography, and other arts. "In line with Emergent Art Space’s mission of creating connections between artists from around the world, and fostering exchange and mutual understanding through art, the exhibition brought together and displayed side by side works by both international and Kolkata artists. ‘Translations’ became a motivating, generative concept, full of potential for further expressive and intellectual developments, as it was well illustrated by the speakers who participated in the panel conversation on ‘Translating Culture’, the musicians who performed Hindu traditional music in the multimedia show ‘Translating Time’ at the opening ceremony, and the many visitors who were as well inspired by it." "The Midway is thrilled to present Contexture, a dynamic experimentation in perspective. This multimedia spectacle features the works of Sean Newport, Jeffrey Yip, James Tucker, Claire E. O’Connor, Rea de Guzman, Mona Marcos, Jason Vo, Jean Nagai, and Robin Birdd. These artists probe beyond their respective mediums—from paint to light to textile—illuminating the brilliant and intense tactility of perception. Saturating their art with geometric repetitions and complex designs inspired by the everyday, the artists of Contexture take us on a veritable odyssey of heightened aesthetics where static objects breathe and trances are turned to dreams." "As Root Division prepares to open our new 13,000 square foot facility at 1131 Mission Street to the public in September--this month, we are presenting our August 2nd Saturday exhibition offsite in the heart of our old Mission District neighborhood. Mission Street is a main artery through a variety of the fastest evolving neighborhoods in San Francisco. In 14 Rapid: Transit and Transition, fourteen artists consider the #14 Bus line, and the evolution of Mission Street in a variety of media including performance, video, painting, sculpture and photography. The #14 Muni bus line runs from Daly City to SoMA and carries passengers representing the rich cultural diversity that San Francisco’s Crocker Amazon, Excelsior, Mission District and SoMA residents represent. While Root Division will no longer be located, “in The Mission,” our new building will be “on Mission.” Please join us in this time of organizational and city wide evolution, as we celebrate our old neighborhood, and look just down the street--only a few bus stops away--to our future home." "Root Division proudly presents New Growth 2015: Heart of the City, our annual Youth Art Celebration & Exhibition, featuring hands-on family art-making activities alongside an exhibition of artwork made by students and instructors in Root Division’s free after school Youth Education Program (Buena Vista Child Care, Cesar Chavez Elementary, Horace Mann Middle School, Mission Education Center, Larkin Street Youth). 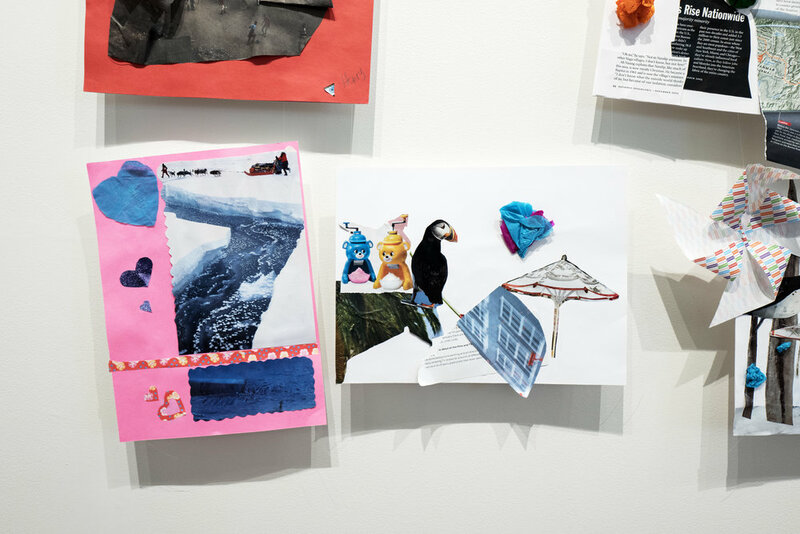 The gallery exhibition on view features creative endeavors in painting, sculpture, drawing, and mixed media made by elementary school students in our Youth Education Program shown alongside the artwork of our artist-instructors."